9/16/06 – “The finals began Friday night in a decidedly darker, more dissonant vein, with the sad, brooding Concerto No. 1 in A minor by Shostakovich and Bartok's Concerto No. 2, the work that helped lead Barnabas Kelemen to his IVCI gold medal in 2002. [Simone] Lamsma, a 20-year-old graduate of London's Royal Academy of Music, began with the Shostakovich. Lamsma demonstrated a capacity for a big, intense sound, ease with a challenging 20th-century work, and great sensitivity to balance with a large orchestra. [Yura] Lee, 21, who studies at the New England Conservatory of Music, followed with Bartok. Lee gave a fabulous performance of the Bartok, full of flair, confidence and physicality. Her performance and fine collaboration with conductor Samuel Wong would seem to solidify her leadership in the contest. [Ye-Eun] Choi, an 18-year-old student at Korean National University of the Arts, also played the Shostakovich. 9/14/06 – In referring to performances from 9/13, the paper called the performances of Korean violinists Yura Lee and Ye-Eun Choi and Simone Lamsma of The Netherlands in Mozart concerti “commendable yet substantially different”. Lamsma began with Concerto No. 5 in A. Lee followed with the same work. Choi closed with Concerto No. 3 in G. Lee, 21, played a sturdy, demonstrative, highly musical Concerto No. 5. She began the Allegro aperto movement with big bow strokes, and played the first- and second-movement cadenzas in an alluring fashion, without overdramatizing. Her Turkish-style rondo in the finale was captivating. She seems headed for a medal. Lamsma, 20, gave a clean, elegant performance of No. 5. Her approach, from the unexpectedly slow first entrance in the opening movement, seemed more contained, more introspective. Choi, 18, played Concerto No. 3 cleanly, but also in a manner that was both quiet and confident. This seemed to be a good selling point for the Concerto in G, as the violin makes many melodic contributions. Frank Huang, fourth-place laureate of the 2002 Violin Competition, served ably as guest concertmaster [of the Indianapolis Chamber Orchestra]. 9/14/06 – The Guardian (UK) report that some restrictions on “hand luggage” on planes are to be relaxed next week after government talks with the airline operators. “The changes are likely to mean bulky items, including musical instruments, will be allowed as carry-on baggage. Orchestras complained that they were being badly affected by draconian rules that effectively prevented musicians taking large instruments on planes. The Department for Transport has been working 'to see if there are any practical steps that can be taken to lessen the burden while not compromising on security.' But it said several restrictions would probably remain, and there was no immediate prospect of a return to the situation that existed before the alerts over an alleged terror plot on August 10 ... Officials will meet industry figures on Monday and the changes could be in place from next weekend. The DfT statement said it would be presenting new proposals 'aimed at lessening the burden on both passengers and operators while allowing us to maintain a rigorous security regime.' "
And for a non-musical but surely relevant tidbit reported in the same paper on the same day: “J.K. Rowling nearly missed a flight back to London when airport security wanted her to check her in-progress manuscript for the new (and last) Harry Potter. ‘A large part of it is handwritten and there was no copy of anything I had done while in the US,’ she said. ‘They let me take it on thankfully, bound up in elastic bands’." Anton Jivaev has been appointed principal viola of the North Carolina Symphony. After graduating from Tashkent State Conservatory in his native Uzbekistan, Jivaev pursued studies with Randolph Kelly at Duquesne University in Pittsburgh and with Roberto Díaz at the Curtis Institute of Music. He won the 2003 Isle of Man Bank Special Prize at the Lionel Tertis International Viola Competition. 9/20/06 – Jaime Laredo will perform the Beethoven Violin Concerto in nine different Vermont communities over 10 days, reports the Barre Montpelier Times-Argus “It’s climbing Mount Olympus, and I hope that by now in my life, I’ve gotten past the tree line,” he says. “I don’t think I will ever get to the top. That is too much to ask for.” Laredo has lived in Vermont for 20 years. “Among his students were up-and-coming soloists Soovin Kim, Jennifer Koh, Leila Josefowicz and Pamela Frank.” Laredo, of course, also led the jury of the Indianapolis International Violin Competition. 9/17/06 - Joshua Bell was featured on A&E's Breakfast with the Arts performing selections from his new recording, Voice of the Violin, which was the number #1 classical CD in the United States last week. Bell will tape From the Top at Zankel Hall in New York on Friday, Sept. 29. Then, on Sept. 30, he and pianist Bradley Moore will perform selections from Voice of the Violin on CBS’ The Saturday Early Show segment "Second Cup Cafe." 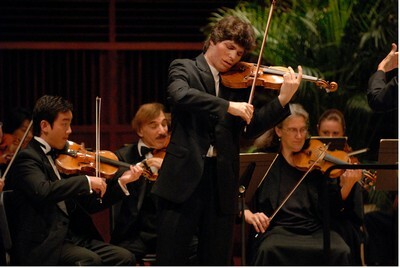 9/17/06 – Violinist Stefan Jackiw played an anticipated recital in Baltimore, reports the Baltimore Sun. He’s been popular in Baltimore since his last-minute substitution for Pamela Frank in 2002 at the ripe old age of 17. ‘Stefan is not just a technical wiz, but a serious musician’, says BSO concertmaster Jonathan Carney. ‘He can be considered in the forefront of today's young crop of violinists. He's got everything it takes’. That ‘everything’ includes a luscious tone, seemingly effortless articulation and a richly expressive approach to phrasing….Born in Boston, Jackiw is the son of a Korean mother and German father. "But the name Jackiw is Ukrainian, so someone must have crossed over way back when," says the violinist…. At Harvard University, where he is a senior finishing up a music degree, Jackiw's elective courses have included astrophysics. His big nonacademic interest: "I'm a very avid and serious runner." 9/15/06 – According to the San Francisco Chronicle, violinist Stanley Block turned 100 this week. Still an active member of Oakland Community Symphony Orchestra, his fellow musicians will honor him with a birthday celebration during their rehearsal. ‘We'll have a cake’, said violinist Lynette DeFazio, ‘and also play Stanley's original score, Happy Birthday Medley, which we've performed in concert in past years’. Block says he's not about to give up his violin, an Andrea Castagneri, built in 1748. “A retired attorney in San Leandro, Block bought the violin in San Francisco, but he can't remember what year or how much he paid. ‘The man who sold it to me said it was owned by a nun who gave up the nunnery’. …Since closing his law practice in 1987, he's devoted himself anew to his violin and said he's never played better. He practices between 90 minutes and two hours per day. 9/14/06 – According to a press release, the Russia- and New York-based Apogee Foundation announced that one of its Apogee World Scholars, violinist Dmitrij Smirnov, had won the grand prize of the Il Piccolo Violino Magico competition in Venice, “which he won last week at this invitation-only event for the world's 15 most gifted young violinists.” Based on his performances at the Venice competition, Smirnov also was awarded the special jury prize including the use of a Giuseppe Gagliano (1782) violin throughout the ensuing year of his training. Smirnov studies at the Rimsky-Korsakov State Music School in St. Petersburg. “He was identified by Apogee as an artist of extraordinary ability during his performances at the 2006 Crescendo Festival, where he was selected by Apogee's award jury as the outstanding performer of the event.” Smirnov will perform at the Apogee Music Festival in Odessa on Sept. 25-28. 9/14/06 – Violinist Dorry Macaulay, “a professional musician who played in front of the Queen,” lost her violin by leaving it on a train, reports the Portsmouth (UK) News. “She is desperate for its safe return, as it has great sentimental value because it was a present given to her by her late grandfather, who passed away three years ago. A frantic search has started, with a host of train stations contacted, but there's still no news on its whereabouts.” According to the 25-year-old’s father, a reward of £100 is being offered for its safe return. The Indianapolis Symphony Orchestra and its musicians have ratified a new three-year contract, extending through September 2009, reports the American Symphony Orchestra League. The new contract calls for a salary increase of 3-5 percent each year for a total of 12.6 percent over three years. Improvements to medical, retirement, and family benefits include the addition of newborn care leave. The contract also allows for the use of archival recordings for educational purposes and a professional apprenticeship program will be introduced for musicians of minority communities to join ISO musicians in rehearsal and performance. 9/14/06 - The St. Louis Symphony has extended the contract of popular music director David Robertson through 2010. According to the St. Louis Post-Dispatch, “The orchestra has enjoyed a resurgence since Robertson took over in 2005, and the new contract continues the trend of American orchestras locking up their maestros long-term, once it becomes clear that the fit is a good one. To celebrate, the orchestra sold tickets to the opening night concert on Sept. 23 for $20.10 each. From the Top, the weekly radio program that showcases young classical musicians, is heading to PBS. WGBH Boston, in collaboration with From the Top and Carnegie Hall, has announced plans to produce the music variety program for television, beginning this fall. From the Top: Carnegie Hall will continue to highlight young classical musicians in its familiar format of offbeat humor, performances and interviews. Production is expected to begin this fall, with the series slated for early 2007. Pianist Christopher O'Reilly, host of the radio series, will continue in that role. 9/15/06 - The Los Angeles Times reports that as part of its 225th anniversary celebration, the city is introducing Hear in L.A. While on hold, callers to the city's 311 information center "will hear classical music performed by the Los Angeles Philharmonic, Los Angeles Opera and the Los Angeles Chamber Orchestra." Plans are to feature "the work of L.A.'s emerging musical artists as the next phase." From The Top is offering free tickets to the television tapings in Carnegie Hall on their website.